There are a lot of change going on in the firearm industry, when we look at what Police departments are doing with purchases of body armor and firearms, ambidextrous, interchangeable back straps, trigger pull differences and multi-caliber options. With all of the recent ballistics improvements, caliber options and even SBR options, the AR15 is hands down the most popular firearm and is the equivalent of what the musket was for a patriot in 1776. Magpul accessories are pretty much a stable for us and it’s hard for us to consider stocking other AR accessories, with their constant innovations they pretty much cover options for everyone. Cheek weld is something that is often over looked until optics come into play. With all of the different optic mounts out there from Larue to Bobro Engineering, it can get really confusing and in my opinion, over complicated. The Magpul Carbine Stocks like the CTR stocks are what we normally push on people when they don’t know what they want. Putting on risers is something you can do later once you learn your gear and understand what changes you might need to make to become more proficient. Batter compartments and QD sling attachments are also something to consider especially if you are doing hard training and understand that flashlights and optics do die out at some point and keeping your Plan B options right on your stock is something to consider. There are times I just purchased something because it looked good, and if I was happy with the product, I’d go back and research what else they have. I’ve used the Midwest rear Flip Up sight for My LWRC M6A1 for years and only had to take it off once I added a magnifier for my Eotech 512. It’s another one of things you learn that whenever you add something to your Carbine, that you might find an issue and have to alter or take something else off. I’ve had a lot of people run into issues when making rail system changes and then finding out that the Surefire tape switch they are using won’t reach around to where they want it to, and end up having to be creative or spend more money to get the job done. 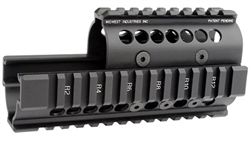 One thing that stands out with Midwest Industries accessories are their rail systems, if you are an AK enthusiast and want to put a light on your rifle, it’s kind of difficult to do with any tradition stock. There are some handguard rail systems that make putting optics like a Vortex Sparc red dot, as a low profile optic, that can make your AK into a nice scout type rifle. I see a lot of sales for the Midwest AK74/AK47 Quadrail. With any alteration of stocks with AK’s, always be aware you are dealing with a product made in the third world and the specs might not be accurate, slight fit modifications are the norm so take your time and don’t break anything. Did you have your Star Wars and G.I. Joe stuff taken away from you and replaced with Magpul Accessories? It ‘s often a line I use when we deal with the “I’m building a rifle” because it’s often the case. Children from the 70’s and 80’s all remember all of the Action Figures and accessories and the TV Commercials that posted all of the cool new Desert Trooper accessories that he came “Dusty”. Watching some of these guys shop for their AR15 accessories and having those Commercials play in my head I can always profile which of those Action Figures they were into. You pick this stuff watching those with certain mechanical skills use different approaches to basically were tastes. While we know we’re dealing with deadly weapons now, there is so much science and skill with being a proficient marksmen that there is nothing wrong with having fun with your firearms because it’s a National Heritage. The AR15 is really the modern musket and there are entry level guns, usually A2 sights and fixed stocks which Magpul has lots of options for modifications. The vast majority of our customers are very happy with Magpul Stocks and Accessories and although we move a considerable amount of Troy and Tango Down pistol grips and stocks, the modifications you may choose for your M4 Carbine are going to be as vast and the shoe sizes of everyone that owns this style of rifle. The Magpul CTR stocks are the first option when moving from a Fixed stock to a varying position but knowing how to get a good cheek weld and not thinking you’re going to have to put risers and over think the gun is the way to start from. If its not working you can always figure it out, just take one thing at a time. This year was a very successful year for us in the Delaware County area in launching our tactical store and we double the size of our business in the first 6 months. People are still finding out about us via word of mouth whenever they need a new holster, police boots or even just Ambulance companies hiring and people needing to get a pair of pants. Much of the product line we stock in our store is for people to checkout instead of buying it online. Duty gear like handcuff keys and various police belts are things that people in the Law Enforcement industry lose or wear out over time and are always in need of. Police vests, tactical pants, uniform pants, belts, hydration unites, SWAT team bags are things that are always wearing out and need to be replaced. We’ve learned there are so many types of handcuffs, swivel and hinged doesn’t always narrow it down, some are different weights and types of metal. The items we have brought in this year are the Safariland lightweight handcuffs and in our region there are no Philadelphia Police Supplies shops around here and many of our Law Enforcement Officers are very happy to see a business like this open up. Tactical vests, body armor are all things people need to be sized up on and this is something that has to be done right so that there are fewer returns. We stock a large number of Blackhawk serpa holsters, safariland products, pepper spray, mace, tasers, batons, police badge holders and more and more duty gear. It’s actually getting fun learning all of these Social Store features but it’s also funny watching Facebook go public and then turn into a bust. I have not idea why people just don’t learn from first hand experience. It’s one thing do a dumb thing twice but looking at the mistakes made with the housing loan, student loans, credit card loans when the heck do people learn? When you are on a firing range or practicing with a firearm, you better not make mistakes because mistakes can mean injury or take lives. Once thing we have learned while growing our business is learning from mistakes. Everyone makes them and it’s nice to know that if you send out a wrong size boot most people don’t mind it as long as you quickly resolve the issues. We are going to be spotlighting some of our AR15 complete upper receivers on inventory and adding more and more tactical gear and accessories to this new feature. You might want to bookmark our new deal of the day category or just monitor us on Facebook. Magazines and mag pouches, tactical vests or belt pouches? Everyone of us has a closet full of gun holsters and gun accessories that we either took off a firearm or purchased and didn’t like. The one thing you find out after you start putting gear on is how bulky it is and how uncomfortable it is to wear. Recently we had a guy stop in our store looking for a tactical vest and liked the Woolrich Elite tactical vests but they didn’t work well with his firearms instructors protocol and he needed a shorter vest that did not go below the belt line. Molle gear is really the way to go anymore because you don’t know what you’re going to need all the time. Not everyone wants to stow a sidearm on their vest and in my personal experience I’d much rather have a sidearm in a leg holster than up near the rifle. Rifle slings can get caught on your Magpul accessories and there is a reason quick detachable accessories are so important. Your life can be endangered if you get in a car accident or get caught in a building and need to get out and your gear is what is retraining you. I’ve seen it many times and I always suggest people consider carrying a strong blade to give you the security to know that you can always cut your gear loose. There are several firearms out there that don’t have the ability to be accessorized with lights and mounts like the AR15 and stock options are very limited. My favorite battle rifle is still the FNFAL and I have gotten MOA out of the gun with very little modification. Having a good mount and I would consider a mount that is welded on is extremely important with this rifle. The DSA SA58 has a very good track record for holding up if mounted properly and that means using loctite. There is also a lot of truth to not over torquing a screws with firearms because you will find out a few thousand rounds later that the screws are sheered off. When it comes to stock options, your old G3 or FNFAL does have more options with Magpul. Magpul Accessories are now the number one gun accessories for AR15s but the Magpul PRS stock is a very good option for making your battle rifle a DMR gun. The battle rifle has seen a resurgence in use and sometimes going back to proven design and making improvements to its ability to be accessorized is the way to do it. The FAL has often been over looked compared to the M1A, but that argument has become less and less. There is more to a Carbine stock than just adjustability and length of pull. Body armor can make your standard Carbine feel really uncomfortable and put on a tactical vest and you’re probable a good 2 inches or more shorter on your Carbine stock. One other thing that comes into play is the amount of play you might end up with if you have a commercial stock sitting on a Mil-spec buffer tube. Knowing something about your Carbines parts history and if its all Mil-spec is going to be very important if you start to accessorize your parts. Magpul accessories give you a lot of options for making your AR15 fit you right and adjust to the gear you may be using. 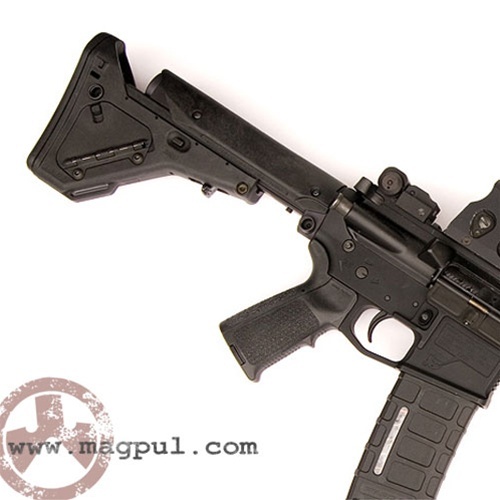 The Magpul MOE stocks and accessories are also something very new and original to consider. Every time you add on more and more accessories to a Carbine the more weight you will add to the firearm and movement and snagging can occur. Anyone that knows what its like to wear tactical pants and walk around a kitchen is going to be able to tell you how many times they’ve torn a pocket on a kitchen cabinet or snagged your pants on a door knob. You will know what I’m talking about if you’ve worn them and if not, do a YouTube search and you’ll see it discussed. 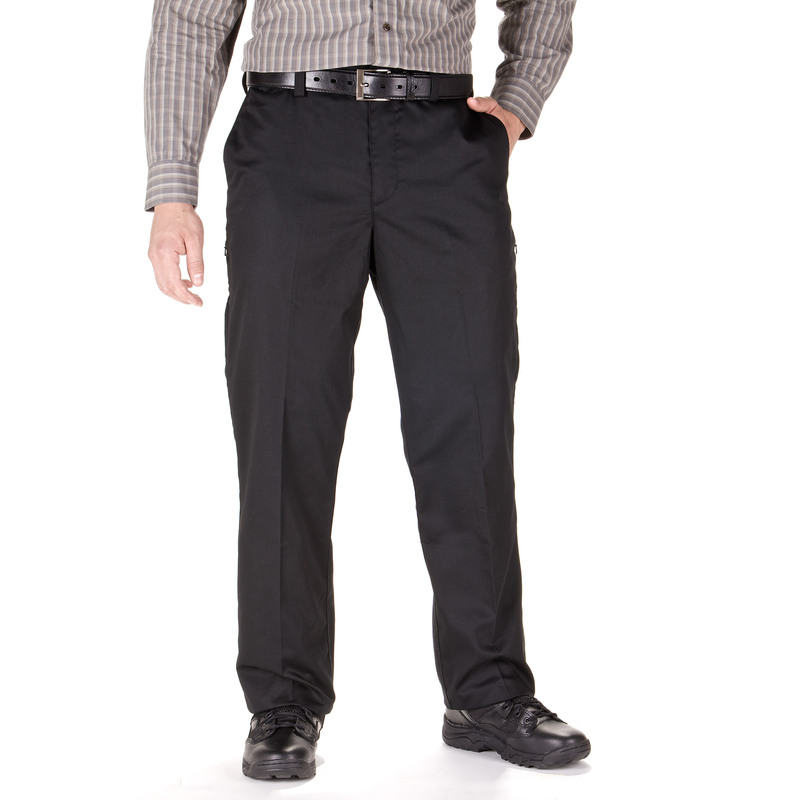 We’ve sold pants to people that torn pockets off their 5.11 and Woolrich Elite pants. When you change grips or add on flashlights, the same things can occur. Gun holsters can get sheered off your body going around corners and even Magpul Accessories can do the same thing. Everyone keeps an eye o n where their optics are but snagging on windows with your gun grips is something that gets learned the hard way. I’ve seen rifles fly out of peoples hands during live fire shootings because they did not clear obstructions and the fore grips latched on to something while they were backing up. I highly recommend you look into the Magpul Angled grips. Nowadays many companies will hit you with restocking fees on gun accessories and in all fairness, the real reason is to deter people from being lazy asses and ordering wrong parts and acting like it was the companies fault something didn’t fit. Many stock accessories tend to not be drop in changes and some fittings may occur, this is very common for non-AR15 style rifles. People make mistakes but 85% of time we get a call about a return on a gun accessory its because somebody didn’t know that the gun had to go to a gunsmith or that they need to buy another mount or accessory to fit it. Many companies also give Free Shipping on an item and if you’ve been a lazy bum and purchased a C-more optic and didn’t know that you needed a $75 mount for it to work on your gun and now you want your money back on the scope, we’ll you’re the person I’m talking about. If you have a question ask it, if you aren’t sure about Magpul Accessories, the manufacturer of your firearm probable knows best. Everyone and there dog is putting the MOE stocks on their guns and if you have a question about it, call them up.